No one is safe! Nuclear testing has resurrected the Jurassic age relic known as the Pterodactyl and now the emcee/producer known to the U.S. as Esoteric has arisen off the coast of Tokyo Bay and brings chaos, crisis, and hysteria with him. 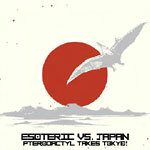 Armed only with the sounds of 70's and 80's Japanese classics, Esoteric must strike against the uncompromising forces that aim to dismember him. He calls upon Gaiking, Godzilla, Rodan, Force Five, Ultraman, the Shogun Warriors, early Japanese surf, punk, and electro bands, and even the Japanese Spiderman to aid him in his fight! The sound created, which he now calls ''Mecha Mecha,'' stands out as the boldest of the daring directions Esoteric has taken his music. With recent genre-bending efforts such as A New Dope, Egoclapper, and Esoteric vs. Gary Numan, the world needed to hear how he handles the beautiful country of Japan. Much tokusatsu is brought on this feature length epic depicting one man's struggle with life as an English speaking Bostonian. FIRE!